War in World War I was not just war—it was unlike anything that had come before in terms of combat tactics, weaponry, communication technology, and modes of transportation. In particular was the airplane, which meant that ground military forces no longer just looked up into the sky to watch for artillery shells. Giant mechanized birds with mounted machine guns and the ability to drop bombs directly from overhead changed the nature of combat in WWI. American military forces would encounter this reality within several hours upon landing on French soil from England. This was particularly the case for the 105th Engineers Regiment, 30th Division, U.S. Army, and their commander—North Carolinian Joseph Hyde Pratt. On the afternoon of June 14, 1918, the 105th Engineers traveling under the command of Lt. Col. Joseph Hyde Pratt arrived in Calais, France, from Dover, England. For three days, the 105th Engineers—which was formed from various elements of the North Carolina National Guard when it was federalized—appears to have camped with the British Army at their Rest Camp No. 6 (East), just on the outskirts of Calais. The camp was a transitional camp used by various elements of the British Army and other Allied units moving from the front to the docks at Calais and back. Rest Camp No. 6 (East), which is also listed as “No. 6 Rest Camp East,” is described in the history of the U.S. Army’s 302nd Engineers as being “a camp of small conical tents, pitched in the shifting sand on the outskirts of Calais. Compared with it, Camp Upton [in New York] was a Paris” . The camp’s tents appear to have been dug into the ground or surrounded with some sort of protection (like sand bags). An American serviceman with the 307th Ambulance Company named Delbert Davis wrote about that the camp, “consisted mainly of tents, sand, mud and stew and English soldiers who had passed through terrible experiences at the front and wanted to tell us about them” . When the 105th Engineers got into camp, Pratt was given a number of single-sheet orders from the British camp commander to be read to the American regiments’ men. One of these acknowledged the new style of warfare found in WWI, entitled “Orders in No. 6 Rest Camp (East) in case of Air Craft Raid.” Although part of everyday life in World War II, air raids were a new experience in WWI. Americans had not experienced air raids in the United States, because no enemy aircraft could travel across the Atlantic Ocean from Europe. 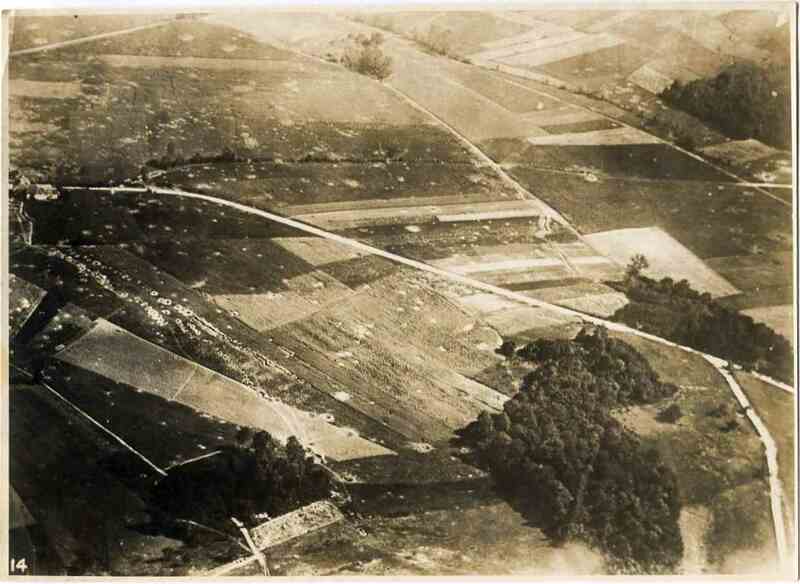 When Joseph Hyde Pratt and his men arrived in Calais, regular aircraft attacks by German aircraft became a daily reality for the first time on June 14, and it was important that they were alert to the potential attacks that could come at any time. 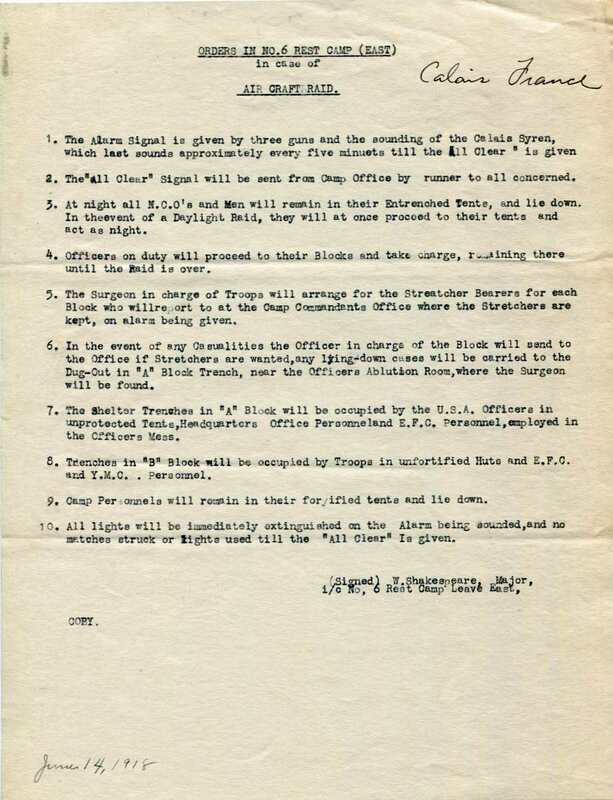 The “Air Craft Raid” order includes 10 important points that all men in the Rest Camp needed to be aware of. Alarms were given by gunfire and a loud siren, men were supposed to remain in their entrenched tents and lie down, and all lights were to be extinguished. This included in Point 10 that “no matches” were to be struck. Airplanes or airships could drop bombs at night over targets, and this was aided by the presence of any light that helped the pilots see ground locations more clearly from the air. Surely, June 14, 1918, was a rude awakening for all of the North Carolinians under Joseph Hyde Pratt’s command that day in Calais, France, in the 105th Engineers exactly 100 years ago this week. You can learn more about the Joseph Hyde Pratt and the 105th Engineers Regiment during World War I in the Joseph H. Pratt Papers in the WWI Papers of the Military Collection at the State Archives of North Carolina. You can also read about Joseph Hyde Pratt's experiences in WWI in a transcript of his wartime diary (the originals of which are held in his papers at the State Archives of North Carolina) published in portions in the 1920s in the North Carolina Historical Review. 1. The 302nd Engineers, A History, edited by Gilbert H. Crawford, Thomas Harlan Ellett, and John J. Hyland [New York, 1920], Pg. 32. 2. Quoted in Alan D. Gaff, Blood in the Argonne: The “Lost Battalion” of World War I (Norman, Oklahoma: University of Oklahoma Press, 2005), Pg. 60. The History of the 105th Regiment of Engineers, Divisional Engineers of the “Old Hickory” (30th) Division, compiled by Willard P. Sullivan and Harry Tucker (New York: George H. Doran Company, 1919), viewed at https://archive.org/details/historyof105thre00sull.